Written records for Mission Mary began in 1902, when a thirty four year old priest from the Netherlands started recording baptisms and marriages. Father Nicolas Brocardus arrived in the United States in 1892 and started serving the Big Bend in 1897. At first Father Brocardus rode the circuit on horseback or in a buggy, later in a Ford Model T. Father Brocardus made his rounds about once a month , at that time baptisms and marriages were performed. Like all growing communities Calera residents eventually decided that they needed a church building, the structure was made of adobe and rock. Although the community was financially poor they banded together to construct the adobe structure( see Lupe Renteria's Story). This original building served the community until the late1930s or early 1940s when the diocese that was building a new church in Brogado plastered the original adobe building. Since Calera never grew into a large community it remained a mission first served by Father Brocardus from Saint Josephs Parish in Fort Davis. Later responsibility for Mission Mary fell on the priest from Brogado. 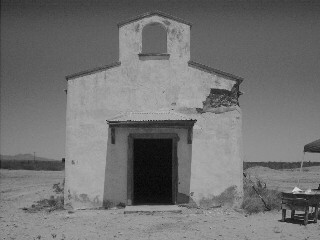 Mission Mary was eventually abandoned and only the Church at Brogado remained. After being abandoned the building became occupied by bats, cows, horses and other creatures. In 2002 Calera Foundation was formed to restore Mission Mary. Picture of Mission Mary just after teardown began in 2002, roof had already been removed. Mission Mary with plaster removed, notice that the top third was adobe and bottom was mud and rocks. Pillars from original church were removed during first renovation.